While doing some fresh scans for 2013, I found a company that has a very small market cap of only $38 million but competes in the very large market of prostate cancer. EDAP TMS SA (EDAP) looks like a very solid speculative play not only because of its future revenue prospects, but also because it brings in significant revenue right now. I always like to see companies who grow responsibly. In the pharmaceutical industry, a company with a low market cap that isn't burning a lot of cash relative to its size is pretty rare. Let's take a closer look. Prostate cancer is the second most common type of cancer in men with 899,000 new cases annually. The market for this disease is estimated to grow to $7.7 billion by 2015. Clearly, even a small fraction of this type of money would make an incredible difference to a company as small as EDAP. Of course, there are big players who put significant resources into capturing these revenue streams. Companies such as Merck (MRK), Pfizer (PFE), Novartis (NVS), Dendreon (DNDN), and Endo (ENDP) all have marketed drugs for prostate cancer. EDAP develops and markets Ablatherm, the most advanced and clinically proven choice for high-intensity focused ultrasound (HIFU) treatment of localized prostate cancer. HIFU treatment is shown to be a minimally invasive and an effective treatment option with a low occurrence of side effects. Ablatherm-HIFU is generally recommended for patients with localized prostate cancer (stages T1-T2) who are not candidates for surgery or who prefer an alternative option. In addition patients who failed radiotherapy treatment are good candidates. Approved in Europe as a treatment for prostate cancer, Ablatherm-HIFU is currently undergoing evaluation in a multi-center U.S. Phase II/III clinical trial under an Investigational Device Exemption (IDE) granted by the FDA, the ENLIGHT U.S. clinical study. The company is also developing this technology for the potential treatment of certain other types of tumors. EDAP TMS SA also produces and commercializes medical equipment (the Sonolith(R) range) for treatment of urinary tract stones using extra-corporeal shockwave lithotripsy (ESWL). In early November, EDAP held a pre- Pre Marketing Approval (PMA) meeting with the U.S. FDA to discuss the submission for the company's Ablatherm-HIFU Phase II/III clinical trial for the indication of low risk, localized prostate cancer. Based on the guidance received in this FDA interaction, EDAP is finalizing its PMA file for submission in January 2013. Ablatherm HIFU was jointly developed by Inserm (French Institute of Medical Research) and EDAP TMS in the early 1990s and is based on technology that creates a precise and irreversible coagulation necrosis of the targeted tissue while preserving the surrounding tissue. This means the cancer cells are killed by essentially being starved of the oxygen and nutrients necessary to survive. In 2011, the company reported results from a 10 year study of the device. The study showed 83% of patients had no biopsy evidence of disease after treatment with Ablatherm HIFU, supporting the technology as a standard primary treatment for localized prostate cancer. Study results were presented at the American Urological Association (AUA) 2011 Annual Meeting, Washington, D.C. The largest, long-term study ever presented on HIFU reported outcomes from 2,552 patients treated throughout Europe, where Ablatherm-HIFU is currently available. Patients diagnosed with stage T1-T3 prostate cancer with low, moderate, or high risk for disease progression were treated with Ablatherm-HIFU. Outcomes were followed using a secure online registry database, which tracked progression as measured by prostate-specific antigen (PSA) levels and prostate biopsy data. Results from this robust, multi-center study were remarkably consistent across progression risk groups, demonstrating that HIFU is effective at controlling prostate cancer for all patients. These favorable clinical outcomes were also highly reproducible, which has a critical real-world impact on how effectively HIFU can be used to treat the disease worldwide. Another product that EDAP is excited about is its Sonolith Praktis which is a modular lithotripter. This is used for a medical procedure that uses shock waves to break up stones in the kidney, bladder, or ureter (tube that carries urine from your kidneys to your bladder). After the procedure, the tiny pieces of stones pass out of your body in your urine. As part of a new modular endourological platform concept, the Sonolith Praktis combines the latest technology developed in extracorporeal lithotripsy with a compact and innovative design. User-friendly- Sonolith Praktis is easy to install with no special personnel or equipment requirement. It is adaptable to all currently used mobile X-Ray systems and ultrasound scanners. Mobility- The machines are transportable and ergonomic while being adaptable to any healthcare environment. Safety- The use of a hydrophone for real-time calculation of the power being emitted combined with an innovative control ensures maximum safety and efficiency. · With its wide power range and optimized geometry, the Electroconductive technology offers total flexibility in the selection of the therapeutic protocol. · Each treatment can be easily adapted to the patient according to their age and health. Our revenues for the first nine months of 2012 reflected the robust sales growth of our renewed lithotripsy device platform. We continue to pursue sales and marketing initiatives around the globe and recently strengthened our U.S. sales team with the appointment of a Senior Sales Manager experienced in lithotripsy. The Company showed 13% revenue growth at the end of the third quarter of 2012, as compared to last year, and we foresee additional positive momentum for the remainder of this year. As we approach the last week of November, our replenished device backlog is comprised of nineteen lithotripsy devices and three Ablatherm-HIFU devices. During the conference call, the company also noted that in October 2012, EDAP appointed Bill Brown as its U.S. based Senior Sales Manager. With more than two decades in the medical field and over ten years in lithotripsy device sales, Mr. Brown joins EDAP's U.S. team to enhance and strengthen the EDAP U.S. expansion program. Also in October, urologists with long-term Ablatherm-HIFU experience participated in a panel discussions at Third International Symposium on Focused Ultrasound, in Washington, D.C. On two separate panels, they outlined their experience using ultrasound guided Ablatherm-HIFU to treat prostate cancer and highlighted Ablatherm-HIFU's substantial clinical track record, with more than 32,000 prostate cancer treatments successfully performed. · Recorded robust 13% sales growth over the nine-month period. · Strong lithotripsy sales in third quarter and replenished fourth quarter device backlog in lithotripsy and Ablatherm-HIFU. · Generated positive cash flow during third quarter 2012. · Held productive pre-PMA meeting with U.S. FDA for Ablatherm-HIFU Phase II/III clinical trial. EDAP recently broke out of an extended down trend dating back to November (shown in maroon) and has moved past the psychological resistance at $2. 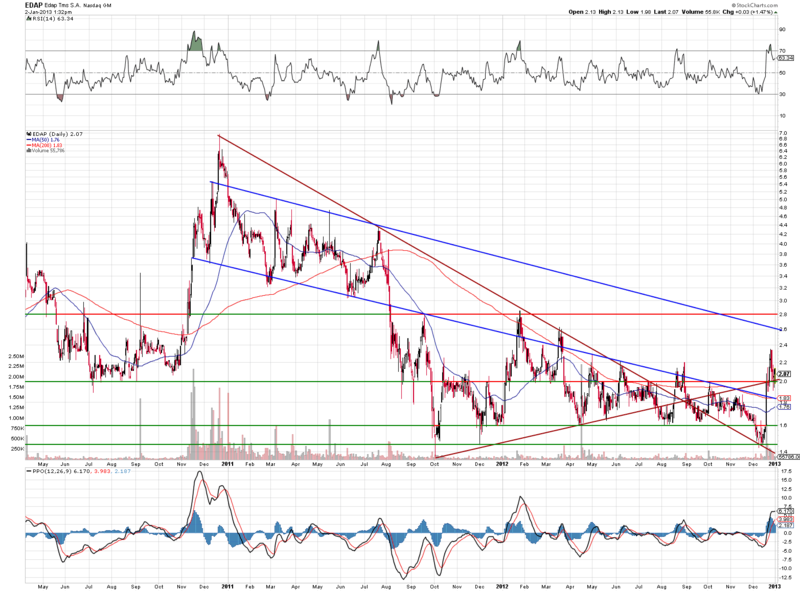 The stock also has formed a new uptrend that could push this much higher. It has found new support at that level and appears it wants to make a break higher to test $2.80. If we can get a large enough volume break at that point there is not much stopping it from testing $3.80 especially for such a low floater. When EDAP received European approval in 2006 the stock shot over $20. Obviously, the stock has been beaten down to around $2/share since. I would typically expect this scenario to be a result of big dilution which is not the case with EDAP. The revenue coming has allowed continued development without harming shareholders even more by printing tons of shares to raise cash. If a European approval could spark the stock this much six years ago, a U.S. approval would certainly seem very significant mainly because of this lack of dilution. This is why I like a reasonable long play or at least an option play where you can minimize your risk while creating high reward potential. In addition, the company has also filed for Chinese approval. Since China tends to piggy back on American FDA decisions of this nature, it could add to the positive nature of an FDA approval. I will be watching the movement of this stock and its related options closely this year. Disclosure: I have no positions in any stocks mentioned, but may initiate a long position in EDAP over the next 72 hours.